Located close to the Jor Bagh metro station, Safdarjung Tomb is one of the few monuments in town that’s not super-crowded, is very well-maintained and is a great place for multiple photo-ops as well. If you’re a lover of architecture and photography, you should definitely drop by. Also known as ‘Safdarjung Ka Maqbara’, the marble and sandstone mausoleum was constructed in 1754 as a tomb for Abul-Mansur Khan (also known as Safdarjung). It’s also the last monumental tomb garden of the Mughals, built a lot like Humayun’s Tomb. The compound of the tomb houses a three-dome mosque, an underground chamber with the graves of Safdarjung and his wife, and the pavilions where the Archaeological Survey of India now has an office and a library. The main tomb is surrounded by manicured gardens, fountains and has a water canal flowing through the compound. 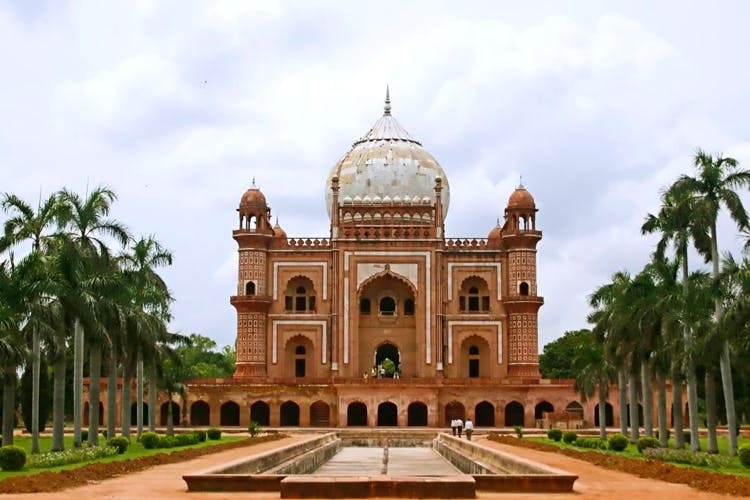 Safdarjung tomb is any photographer’s delight, especially for those who love taking balanced, architectural photos. The tomb also has a lot of interesting details like Arabic inscriptions on the walls and carved ceilings. While right now might not be the best time to drop by Safdarjung Tomb, it really does make for worthy pit stop when the weather’s good and you’re passing by. Entry fee: INR 15 (Indians) and INR 200 (foreigners).